Grapefruit essential oil has an uplifting, tangy scent produced by the health-enhancing phytocompounds known as citronellal and limonene. When inhaled, these medicinal plant chemicals cross the blood-brain barrier and interact with the brain’s limbic system–the region that controls emotions and influences the nervous system. Grapefruit essential oil has an invigorating, uplifting scent that can help relieve stress, improve your mood and promote a sense of well-being. Simply inhaling grapefruit oil is shown to lower your blood pressure by activating relaxation responses in the brain. One study looked at the stress response of rats when treated with d-limonene–an active therapeutic compound found in grapefruit oil and other citrus essential oils. It found that those treated with d-limonene had decreased stress compared to those not treated, according to both behavioral and psychological measurements . D-limonene regulates serotonin receptors in the brain to promote balanced levels of serotonin–the “happiness hormone” that has been linked to anti-anxiety and stress-relieving effects . 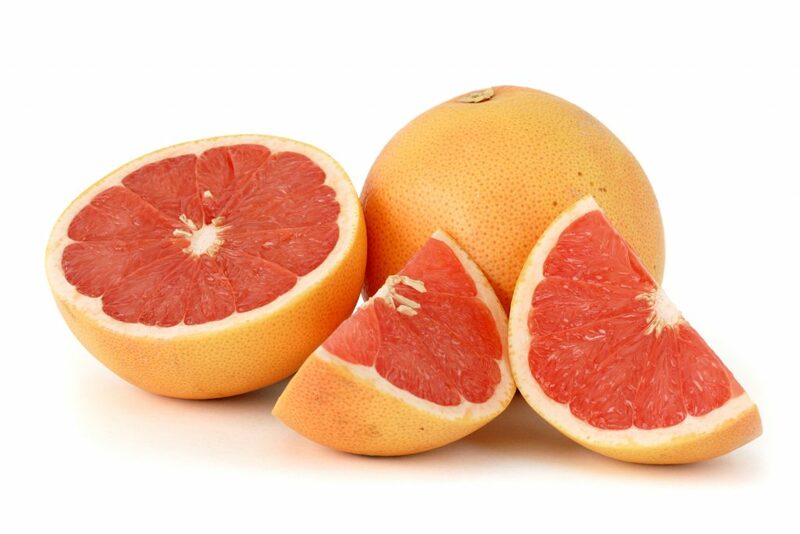 You may have heard that grapefruit is a fruit that can help you burn fat when you eat it. The active compounds in grapefruit reduce your appetite and boost your metabolism, which results in fewer calories consumed and more calories burned [3, 4]. However, you don’t need to eat it to reap these benefits. Grapefruit essential oil delivers a high concentration of grapefruit’s medicinal qualities when you inhale the aroma or apply it to your skin. Besides helping you burn more calories and lower your appetite, it also stimulates your lymphatic system and acts as a diuretic, helping you lose excess water weight and reduce bloating. In a study, researchers found that inhaling grapefruit oil increased lipolysis, which is the breakdown and release of fatty tissue stored in the body . All these actions combined make grapefruit oil a great essential oil to help you improve weight loss efforts. Chronic inflammation is linked to a host of long-term and age-related problems, as well as mental health conditions like depression and anxiety. It plays a role in the pathogenesis of many diseases, including diabetes, heart disease, arthritis, cancer and Alzheimer’s disease. Grapefruit oil has the ability to lower inflammation by directly modulating your body’s production of cytokines–the part of your immune system involved in the inflammatory response . By downregulating your body’s inflammatory response, using grapefruit oil as an aromatherapy oil can help in the prevention and treatment of inflammatory conditions. Its ability to dilate blood vessels and lower blood pressure also improves the circulation of blood, which can make it a great remedy for headaches, muscle pains, menstrual cramps and more, especially when applied topically to the site of pain or swelling. When you’re feeling physical or mental fatigue, grapefruit oil’s aroma can pick you up. It’s been proven beneficial for countering symptoms of adrenal fatigue and burnout, such as low motivation and sluggishness. In addition to relieving stress, it combats the effects of chronic stress, such as immune system suppression. In one study, researchers suggested that grapefruit oil could even reduce the amount of medication required by people with depression . Grapefruit oil also fights brain fog, promoting mental clarity and better cognitive function. It increases alertness yet calms your nerves at the same time. It’s shown to boost levels of the neurotransmitter acetylcholine, which is associated with improved synaptic function in your brain, as well as better memory recall and learning ability . Your lymphatic system is the network of channels through which toxins and waste are drained from other parts of the body to be eliminated, like a sewage system. The lymphatic system can become sluggish, which is linked to cellulite, arthritis and gout. Grapefruit essential oil stimulates the lymphatic system, speeding up its detoxification of the body. As a diuretic, it also stimulates the kidneys, helping to prevent kidney infections and stones. You can use grapefruit oil as a tonic to help clean up and tone your organ systems, which in turn boosts overall health. The antiseptic qualities of grapefruit oil make it great for preventing infections on minor wounds or cuts. Studies show it even fights bacteria responsible for foodborne illnesses, as well as parasites and fungus . It’s even been shown to effectively treat urinary tract infections . You can take 2 or 3 drops of grapefruit oil a day for an immune system boost by combining it with a spoonful of honey or adding it to a glass of water or juice. Using grapefruit oil in your hair can cleanse your scalp, reduce greasiness and add shine. It also improves microcirculation in the scalp, which improves the delivery of nutrients to your hair follicles, which grow new strands of hair. Adding 1 or 2 drops to a dollop of shampoo can help you improve the overall health of your scalp and hair every time you wash your hair. You can also combine a few drops of grapefruit oil in a tablespoon of a carrier oil like coconut or jojoba oil and massage it into your hair an hour or so before you wash it. With its antibacterial properties, grapefruit essential oil can help keep acne outbreaks under control. It also balances the production of sebum, which is the skin’s natural oil, to promote moisturization if it’s too dry or to reduce excess oiliness. Grapefruit oil also protects against UV light damage from the sun, providing a natural source of SPF you can add to your daily moisturizer or a carrier for sun protection. As a source of protective antioxidants, grapefruit oil defends against free radical damage, providing you with all-natural anti-aging benefits . You can enjoy the benefits of grapefruit oil as an aromatherapy oil by adding a few drops to an essential oil diffuser, dropping some onto a cotton ball or handkerchief and inhaling it, or even inhaling it directly from the bottle. You can add an extra dose of aromatherapy in your life by adding grapefruit oil to homemade house sprays and beauty products. Grapefruit essential oil products vary in their level of quality. To ensure you get the most out of what this powerful natural medicine has to offer, be sure to use only 100 percent pure therapeutic grade oil. Especially if you have sensitive skin, it’s a good idea to mix grapefruit oil with a carrier oil like olive or coconut oil before putting it directly on your skin in case of any unwanted reaction or irritation it could cause.